The François Perrodin exhibition showing at Galerie m Bochum is the third solo exhibition the gallery has devoted to the artist. Already in his early work groups, Perrodin explored proportional relationships, serial and variable aspects, geometry and asymmetry. At the same time, the formal multiplicity of his objects and object groups can be traced to a systematic basic concept stemming from clear-cut, mathematical rules. His works all revolve around the same conceptual core, spiraling in ever closer, series by series, work by work, each defining it more precisely in its own way and using its own method. 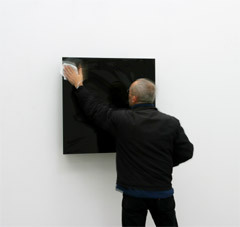 His over thirty-year career has thus produced a number of serially arranged, framed glass surfaces, back-painted in a monochrome black, emerging from the artist’s structural analysis of how frame and picture plane relate. In Perrodin’s works, the frame is an integral part of the picture/object, while the picture surfaces themselves do not show any painted representation, but rather become mirrors reflecting the surrounding space, the viewer, and also the light. They manifest not only the basic structures of what our culture defines as a picture in the traditional sense (a framed picture plane), but also hold up a mirror to the viewer and his perception. Color is a critical element of these works. 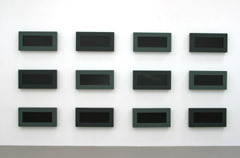 The two blackish hues in Perrodin’s palette, gray-black and green-black, frame the reverse-painted black glass surfaces, while the glass, depending on the fall of light, shimmers in tones ranging from black, charcoal or gray to light gray. The use of two tones in each work in the series provides a further means of structuring the group – for example, in echoes between works hung diagonally from each other – which yields a pattern going beyond the individual picture. 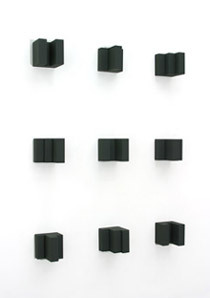 This work group of framed picture surfaces is juxtaposed with a series of cubes from which graduated, concave or convex forms have been cut out. These objects are then arranged in specific relations to each other. As in a puzzle, the viewer tries to mentally fit together the various shapes, searching for the match for each one. Since the nine-piece work on display is only an excerpt from the 300 possible variations, however, and since the work is arranged for asymmetry rather than symmetry, this attempt is bound to fail. Perrodin is concerned in his works with the question of how reality comes into being out of the act of seeing, out of a gaze dictated by our cognition, our memories and our perceptual habits – habits that, when confronted with his works, automatically bow to the reflex of trying to bring their asymmetrical aspects into a symmetrical harmony. The individual objects always react to each other, to the space in which they are placed and to the viewer. The way they come into existence anew under the spectator’s gaze reveals the significance of the interrogation of reality and how it is constituted for Perrodin’s work. In addition to his strict formal considerations and precise definition of his objects, Perrodin’s use of color is likewise telling. His gray, green and black tones are always just on the verge of becoming what they are, generating an impenetrable black depth, which both absorbs and reflects the light. Color for Perrodin is derived from black with the addition of white. This is done on the basis of a system he set down 30 years ago, with the addition of other colors representing a further step.